"Made with sweet potatoes, dried cranberries, and pecans, these taste like they should be on a holiday table!" Preheat oven to 350 degrees F (175 degrees C). Grease 6 jumbo muffin cups or line with paper liners. Soak dried cranberries in a bowl of hot water until plump, about 10 minutes; drain. Combine whole wheat flour, white sugar, oat flour, baking powder, baking soda, salt, cinnamon, and nutmeg together in a bowl. Beat sweet potatoes, eggs, and coconut oil together in a separate bowl until smooth; stir into flour mixture until batter is smooth. Fold plump sweetened cranberries and pecans into batter; spoon into prepared muffin cups. Bake in the preheated oven until a toothpick inserted in the center of a muffin comes out clean, 25 to 30 minutes. Really a lovely recipe. I used a can of unsweetened pumpkin for sweet potato and oatmeal instead of the whole wheat flour. 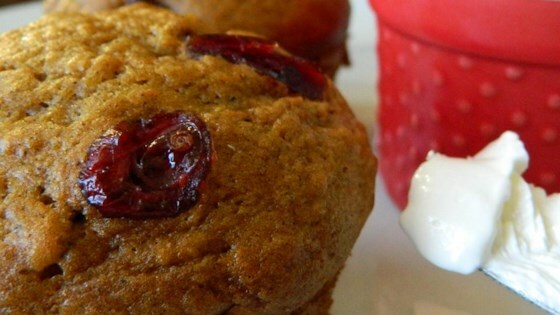 Perfect muffins and a great way to use up leftover sweet potatoes. Thanks for sharing!